Ian Holloway hopes to convince Kevin Phillips to stay and play Premier League football for Crystal Palace after the 39-year-old’s nerveless extra-time penalty won the Championship play-off final for them. Phillips, a second-half substitute, scored the only goal of the afternoon after 104 minutes and said afterwards that it might have been his last kick in professional football. But the Palace manager Holloway, who brought Phillips on loan from Blackpool in January, said he hoped the veteran striker would keep playing. “I’ll keep signing him until he’s nearly 50 or 60 if he keeps putting the ball in the net,” said Holloway afterwards. “I do not understand why anyone is surprised about Kevin Phillips. He can keep on going as long as he wants. His game is unique; he finds space. 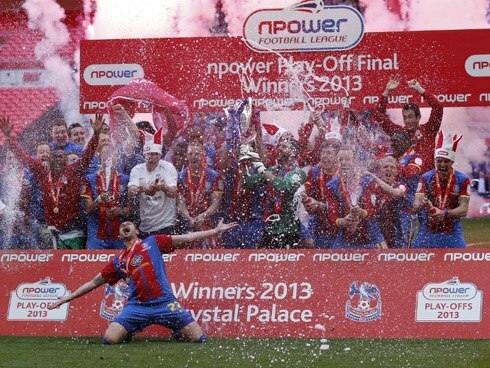 Holloway, who won his second play-off promotion after victory in the 2010 final with Blackpool, said Palace would have a busy summer ahead. “We need to do an awful lot of work now,” he said but added: “It is not how much you spend on the group but what is inside their heart and how they want to work for you. For me they are Palace heroes.” Holloway also played down the prospect of asking the new United manager David Moyes for Zaha on loan again next year. Palace can expect to make at least £120m in additional income thanks to the result. New television deals worth £5.5bn come into effect next season, meaning increased money for the 20 teams, and even if Palace are relegated they will receive four years of parachute payments.